It is Wednesday evening here in Xela, Guatemala. I am writing from my apartment, with my panoramic backdrop of the city surrounded by the mountains, the various shades of blue as the mountains and sky meet before the night sets in is something to behold. I have a bit of Eddie Vedder playing in the background, a strong cup of tea. Not bad at all. The last five weeks or so since my last blog have been busy. I started working with Alterna Impact at the start of the month which has been interesting. I took in a puppy short term to provide some help to an organisation here that saves street dogs. We celebrated Guatemalan Independence here in Xela, what seemed to be a full month of weekend celebrations. 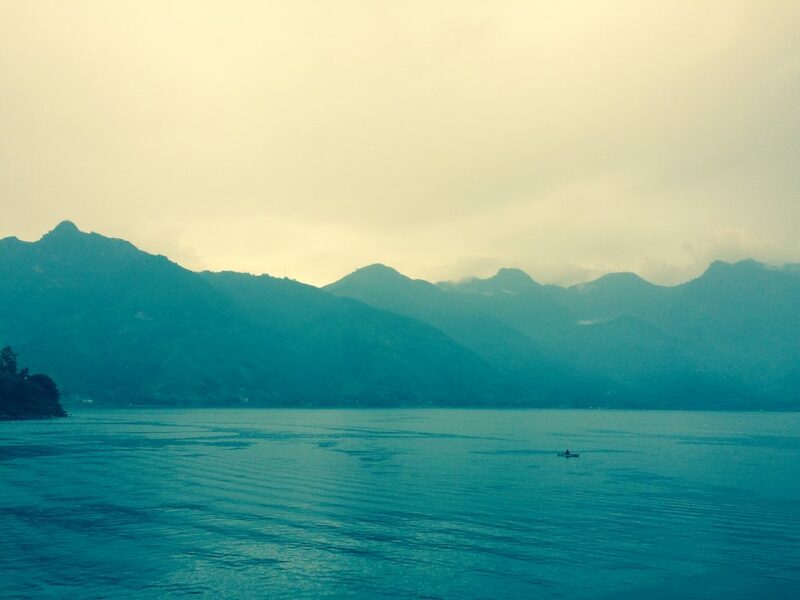 As well, I took a trip to Lago Atitlán , an amazing spot to get away from everything and recharge the batteries. Nature sent us a message too. We were hit with an 8.1 magnitude earthquake on the night of September 7th. The epicenter was off the Pacific Coast. Mexico was hardest hit but it was felt strongly in Xela too; being in an apartment on the side of a hill that is shaking for a good 2 minutes is quite scary. We are in the so-called ring of fire here in Guatemala so I guess it is the risk you sign up for. What is the alternative, stay at home safe on the couch? No chance. In early September I started my fellowship with Alterna Impact, an impact investment firm based here in Xela. Cheers to everyone who wished me luck. It has added a new dimension to my Guatemalan experience. First of all, there is a great group of people in Alterna, from different backgrounds and different countries. There is a real sense of people being excited by the work they do rather than simply working for the sake of working. We are in Guatemala; these people are not doing it for the money. Secondly, I am genuinely interested in the impact investment sector. So it is a great opportunity to assist in the development of Alterna’s investment strategy as they prepare to invest in Guatemalan social entrepreneurs over the coming years. In my first few weeks I delved into the sector, reading material from various participants – advocates, investors and investment firms – before writing a 20 page paper on the sector and my thoughts on what I believe is important in terms of defining the investment process. It was a bit philosophical in parts, but that’s what you need if you want to provoke thought. I was chatting about some of this stuff with some colleagues and one of the Italians, a sound guy who works on the data side, got a laugh off me saying I was a philosopher. ‘Finance and philosophy, they go together right’ he said with a wry smile. Of course I was saying it half in jest, I am not a philosopher in the Socrates sense of the word. But I am someone that believes in questioning everything. For me, the impact investment sector is fundamentally about the pursuit of a new approach to investment and business so why be constrained by traditional approaches. Since, my report has been the springboard for some interesting brainstorming sessions among our team as we have debated out various aspects of the investment process. The first step is about arriving at your investment philosophy that you can truly believe in and most importantly articulate what it means, beyond your standard jargon. Once you have achieved that, you can work towards setting a strategy to achieve your agreed objectives. Core to everything will be the explicit adoption of a stakeholder centric business model as a conduit for social change. It is interesting to be part of this process and to know that after I have left Alterna (I am contracted up until the end of December) and Xela I’ll have made an impact in an indirect way. I have been asked by some people at home ‘why don’t you just go travelling, why bother working if there is no real financial gain?’ I don’t believe money should ever be the main motivator for doing something. For me the challenge and experience is living and working in another country, immersing myself in the language. I am lucky enough that I like the world of economics and investments, just as I like writing. Around that if I can work with good people, have some autonomy and flexibility, then I am happy. I have that with Alterna and so I haven’t had to sacrifice on my main goal of becoming fluent in Spanish. Xela is a great place to make that happen. So I am fast approaching almost five months of living here in Xela, learning Spanish. What level I am at now? I don’t think I can give you a precise answer on that. It is one of those things about learning a language; it is difficult to gauge the progress from week to week, month to month. I don’t overly focus on trying to gauge my progress; otherwise I believe you open yourself to a lot of frustration. Still, I would say the difference between now and when I arrived is night and day. Conversationally I am much more comfortable, but there is a long way to go to be at the fluency level that someone described to me as ‘being able to be exactly the same person in Spanish as you are in English’. Con mis mejores amigas, las gemelas. One of the things about travelling is that life can be fairly transient, people come and go. It is a little different living here because I know more locals or other foreigners settled here but the students come and go. 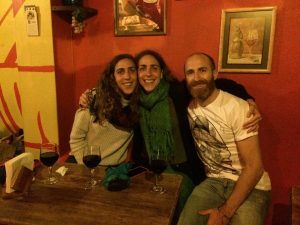 Two people I have shared almost my entire Xela experience with are Isabel and Laura, identical twins from Nashville, Tennessee. They arrived in the same Spanish school about a week and a half after me. We hit it off instantly and like me they decided to stay longer than planned, leaving Xela just over a week ago to return home to Nashville. The reason I tell you this is that the weekend before they left we recorded a podcast for fun, a 50 minute conversation in Spanish. The podcast was a way of recounting some of the memories we shared in Xela but also a nice way to mark our progress in learning Spanish. I think when I arrived if someone had asked me what kind of progress I’d like to see, I’d be very happy to be at the level of being able to record a podcast in Spanish with friends some four months later. We know it is not perfect, there are mistakes but we were able to communicate without any issue and could have easily kept chatting. In the end of the day, that is the essence of learning a new language, being able to communicate with others. I think it is a good motivation to keep going. Click below for the podcast, with a five minute intro in English. One of the more interesting things I have done since I have been here is to adopt a puppy short term. Walking into the city centre one day my friend and I came upon a group showing puppies for adoption. 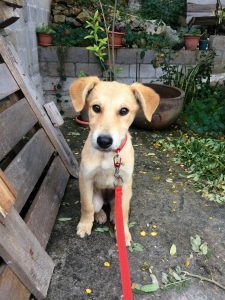 We learned the group was GUAU XELA, a group of volunteers who work hard to save the lives of the abandoned street dogs of Xela. My friend and I debated the practicality of adopting a puppy. It was hard to walk away but we eventually did, some hour and a half later. However, the organisation got in touch with me and asked me to take a puppy short term, to help with feeding and injections while they found a permanent home. Hence, the arrival of La Niña, Torres! It was a scared skinny puppy, full of fear and no bark. I gave her the name Torres after the Liverpool legend, Fernando Torres. For some perhaps, probably United fans, that is the final act of cruelty, naming a dog Torres. Still, when she left on Saturday (Oct 7th) for a permanent home, just over a month later, she was fattened up and with the relevant injections needed. She had not shaken all her fear from her abandonment on the street but she had found her bark. She was so afraid that it was very hard to really connect with her but it was nice to help out and make a difference. A small difference in the grand scale of things but a big difference to this little puppy and the life she will have. Buena suerte Torres! Sadly, many dogs are maltreated here. Everyone that has been to Xela is aware of the problem of “los perros de la calle” (the street dogs). For some people, dogs are just animals. For me, dogs are a courageous, smart and loyal animal. Look at the amazing work of the rescue dogs in Mexico recently! After my experience with Torres, I decided to set up a fundraiser to raise money for GUAU Xela. Their motto is: “Somos un Grupo de Voluntarios, DISPUESTOS a trabajar por los que no tienen voz” (We are a Volunteer Group, WILLING to work for those who have no voice). I’ve seen how passionate these volunteers are but they require more funds to be able to pay for food and in particular the veterinary work needed to restore the dogs to good health, as they work towards finding permanent homes for these forgotten animals. 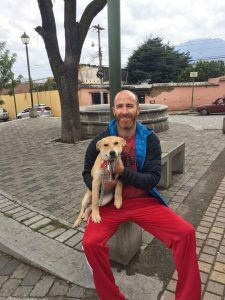 Donate: Link – Help man’s best friend by supporting GUAU XELA, saving dogs! 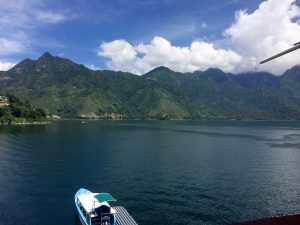 Why bother with Guatemala you might ask? And dogs? I think it is an excellent use of a donation because the marginal utility of your €/$/£ is significantly higher than a similar donation at home, i.e. your donation goes further and you can make a real impact. Also, there are no middle men. Charity has become a business and the various scandals have created skepticism on the use and effectiveness of donations. I still favour the small community groups on the ground. In this case, the money will go direct to pay for the veterinary costs; remember the people involved are all volunteers. In the interest of ensuring full transparency I’ll provide a full record of the use of the funds raised, including veterinary receipts. There are a lot of problems in the world. Sometimes the scale of the problems are so huge that people become apathetic, that feeling of ‘what’s the point? One person can’t make a difference.’ That’s why I believe in starting small, making an effort to help the community around you. GUAU XELA is doing that and they just need some help. I can take in another puppy but I can make a bigger difference if I can motivate enough people to make a small donation. Help out if you can. Cheers.